Have you ever elbowed your way through a crowded room and thought, ‘Who are all these people?’ That’s how I feel when I rummage through my jewelry drawers. Not only do I own pieces that I can’t figure out how to wear, I own pieces I can’t even identify. At some point in the distant past, I thought it was a good idea to acquire these things. Looking at them is like reading old diaries: I don’t want to show them to the general public, but can’t bring myself to get rid of them. This, for instance. What the hell is it? Well, it’s a pendant, handmade, in gold. Two peridots and a nice piece of lapis. I bought it because the colors looked so pretty together, but I don’t think the stones really belong with each other, and I’ve never been happy wearing the piece. Actually I bought it because it was made by Thelma Kirsch. She and her husband, Bert, used to have a booth at the White Plains Gem and Mineral Show in the 1990s, when it attracted all sorts of interesting vendors. Thelma was in a wheelchair and looked Native American but wasn’t. She had long gray pigtails and wore long necklaces hung with various charms and totems, including a bone carving of a Malamute that reminded her of her late dog Suzy. (The lapis pendant might have worked on such a necklace.) She sold Native American and Asian pieces, mostly, and I almost always bought something from her. The intricate Chinese carving above, for example—two nested cats in lapis lazuli—came from Thelma. 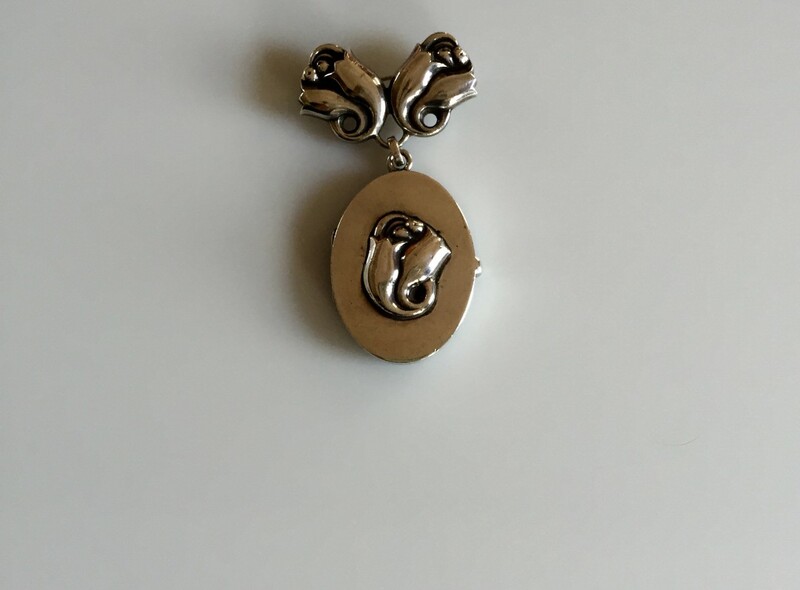 Twinned cats are a traditional Chinese motif, and now that I think about it, Thelma sold me another cat carving, in jade, that I wore as a pendant. What’s special about this carving, above, is the way the carver has exploited the natural colors of the jade to give one kitty a green head and the other a lavender head. At one point I had a jeweler thread a gold loop through the opening at the upper left, so I could wear it on a chain. I had two cats at home and it seemed a sweet way to bring them to the office. But it was really too clunky to make a good pendant. Thelma might have worn it. One year we got to the mineral show and there was only Bert. Thelma had died—she was just 63—and he was numbly selling off the last of her inventory. We didn’t see him after that. And I still think about a piece I wish I had bought. When did I buy it? What was I thinking? What, even, is it? It’s a pendant, right? Has to be, because of the bale (at the top) set with diamonds. But what a scrawny dangly thing it is, 5.5 millimeters long and, at most, barely half a millimeter wide. The stones are nice. Diamonds, obviously. The pale green stones are cat’s eye chrysoberyl, a gem that fascinates me. The dark brown stones, I’m pretty sure, are star sapphires. Under halogen light, they have beautiful six-rayed stars, so tiny you practically need a loupe to see them. It’s almost as if a jeweler had these stones lying around and strung them together. The piece might make one nice earring; or it could be split into a slightly mismatched pair. But I’m not going to do it. Such projects are usually more trouble than they’re worth. I’ve been flirting with cat’s eye chrysoberyl for decades. The stone in the ring above, for example, has all the right properties: it’s a clear, greenish gold with a sharp white spine of light, what gem dealers call ‘milk and honey’. But like most cat’s eyes in my price range, it’s tiny; and the depth of the stone makes it problematic to set. Look at how high this little ring sits on my finger (at right). I ought to have it reset—someday. Then there are the loose stones I’ve never bothered to set. I own dozens. My husband purchased most of them out of a genuine interest in unusual gems, back in the days when we went to gem shows. Most aren’t particularly valuable, but it would cost a lot to commission settings for them. The stones below, however, are rare. They’re trapiche emeralds, which are formed when black shale matrix gets incorporated into an emerald crystal as it grows, in a complicated process I can’t understand, let alone explain. The larger stone is about three and a half carats; I don’t know the weight of the smaller. Trapiche emeralds (which were named for the six-spoked grinding wheels in sugar mills) do get made into jewelry. But I can’t see wanting to wear these. So they’ll stay in their little pouch, deep in the drawer. And then there’s the necklace below, which I adore but never put on. It was made by Rachel Lemoine, who has sold me many a bauble at the Block Island Farmers Market, where I ostensibly go to buy local honey. I love Rachel’s jewelry, which is quirky and bohemian and generally quite affordable. This necklace, though, involves 18-karat gold, old coral beads and many multicolored sapphires. It was expensive, even at the reduced price I paid after admiring it for several summers. But what I love about it—its joyous aggregation of small bright things—makes it tricky to wear. It doesn’t lie quite right at my throat. (Necklaces are surprisingly hard to engineer.) It’s possible that I need to have it shortened so the stones don’t clump together. Or maybe…maybe it needs to be owned by someone younger and more exuberant than I. Someone who will wear it.